Do you wish there was a magic wand you could wave to add storage space to your Springs luxury apartment? You don't have to be a magician to perform these easy and effective tricks to pull extra storage space out of thin air. The back of the toilet is a perfect spot for a basket to hold extra toilet tissue, magazines or shampoo and body wash.
Over-the-sink shelves work for both the kitchen and the bathroom. Slim tall-boy cabinets, such as this one from Amazon, can squeeze into a surprisingly small amount of space. Doors of all sizes, from rooms to cabinets, provide stretches of unused space. They accommodate hooks, racks and vertical holders. Place a lazy Susan inside a bathroom cabinet to keep toiletries and cosmetics organized and easily accessible. Eliminate nail polish clutter by storing the bottles in a spice rack. Turn towel storage into a conversation piece by using a wine rack. A classic steamer trunk offers oodles of storage while also serving as a funky coffee table. You can get a similar effect stacking vintage suitcases to form a coffee or end table. Speaking of suitcases, do yours sit empty when you're not traveling? Use them to store off-season clothing and items that you infrequently use. An extender rod is an inexpensive way to instantly double your closet space. Who says items can sit only on top of shelves? Under-shelf baskets are great in kitchen cabinets but also work well in closets. 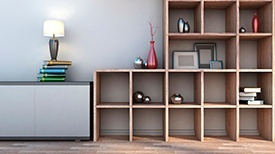 Bookcases and coffee tables can hold even more items when you add several baskets that act as "drawers." We know that you are always looking for storage space, so our Springs luxury apartment homes include generous walk-in closets as well as coat and utility closets. Attached and detached garages are available to provide room for some of the bulkier items. Stop in and learn more from a friendly member of our on-site management teams!